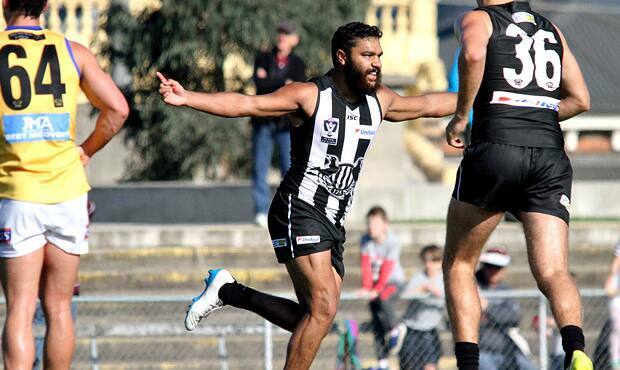 Kayle Kirby kicked six goals in the VFL Magpies win over Sandringham. Photo: Shane Barrie. Collingwood has won its first VFL game since the first week of April with a 14-point victory over Sandringham at Victoria Park. With the lead going back and forth throughout the game, the VFL Magpies kicked the last three goals of the contest and turned the tables on the higher-placed Zebras. It was a crucial period of momentum which mirrored another hot patch in the closing stages of the second term. After Josh Bruce kicked his fourth goal before the main break, youngster Kayle Kirby kicked two in a minute to bring the half time margin back to two points. While Bruce played limited minutes in the latter stages of the game, Kirby ran wild. The livewire forward kicked another pair of back-to-back goals in the third quarter and finished with six majors for the game in his best VFL Magpies performance. Matt Smith returned from a leg injury to be named Collingwood’s best player, while Sam McLarty, Lachlan Tardrew, Jordan Kelly and Chris Mayne also impressed.